I’ll admit it. Every now and then I do get pangs of schadenfreude when I see brands being pulled up online by the media and the public. However, seeing a brand destroy itself is a different proposition. I’ve been watching Nakheel for some time, and I’ve written about the company and its bad media habits before. The Dubai government-owned real-estate developer is responsible for some of the Emirate’s most iconic projects, including the Palm Jumeirah and The World. However, its customer service is, unfortunately, just as infamous as its successes are famous. Last week, Sarah Townsend of Arabian Business wrote a scathing piece on Nakheel. Entitled ‘Nakheel PR: The toughest job in Dubai?’, she took a sledgehammer to Nakheel’s reputation The article is well worth a read, especially for those of us whom have spent long enough in the region to forget what quality journalism looks like. If it were just one person taking aim at Nakheel, the issue would be manageable. However, due to our digital world reputation-bashing is a team sport. 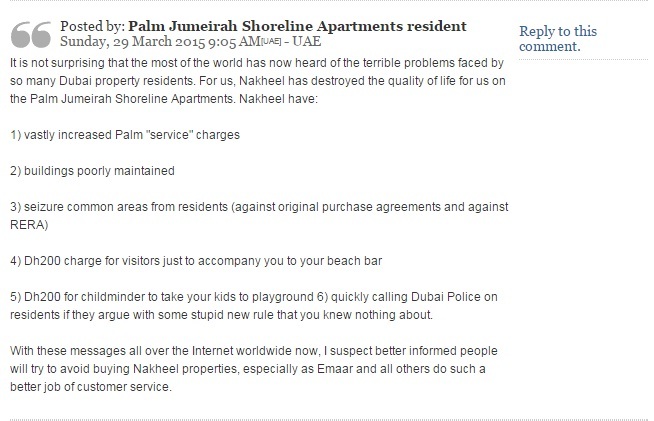 The article has gathered seventeen comments, all negative and some from disgruntled Nakheel owners. My favorite is the below. On top of this, Nakheel is facing additional issues regarding its stalled Palm Jebel Ali project. However, it’s not the media which is causing trouble for Nakheel, but rather angry investors who have yet to see their properties take shape after years of delay. To quote from The National. All the units under the Palm Jebel Ali project, including its signature and garden villas and water homes, are “under cancellation”, according to Dubai’s Land Department. In November, 74 homeowners wrote to Mohammed Al Shaibani, the head of the Ruler’s Court and Dubai Investment Authority, to look into the matter. Over a 100 Palm Jebel Ali owners have set up a group on Twitter with the handle @PJAOwners to lobby the government on their issue (bizarrely Nakheel doesn’t have an account on Twitter and there are several Facebook accounts, none of which seem to be legitimate). At the end of her article Townsend stated that Nakheel are looking for a PR exec to join their ranks. I could be even bolder and suggest that they look at how they do business and rebuild their reputation first. 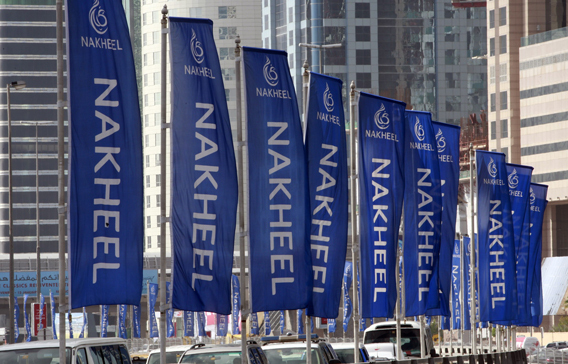 Anything else would be putting the cart before the horse and will continue to destroy what is left of Nakheel’s brand. I’m betting things will get worse for Nakheel in terms of its brand image and reputation. But I won’t take any pleasure from watching this sorry story of a brand being destroyed from within. This entry was posted in Public Relations, United Arab Emirates and tagged arabian business, brand building, brand crisis, brand equity, crisis communications, media relations, Nakheel, Palm Jebel Ali, Palm Jumeirah, twitter by alexofarabia. Bookmark the permalink.